For the past 16 years, Chaos Group have used dongles as a primary protection method of their products, like VRay for 3DS Max, until the addition of the Online licensing system (OLS) option 2 years ago. During this time, a lot of user feedback was collected on their licensing methods, and after a detailed analysis, Chaos Group have made the decision to phase out dongles over the next year. We’ll do our best to ensure a smooth and easy transition for all customers. Not quite yet. We will stop actively selling new dongles in Q3 2019, and will continue servicing customers with dongle-based licenses as long as their product version is officially supported. Chaos will be gradually increasing the number of users and expand product versions eligible for auto migration to OLS using their Migration tool. Also, Chaos Group are actively working on extended borrowing for offline use, which will be introduced in the next couple of months. We will continue selling Chaos Group licenses both with dongles and OLS. 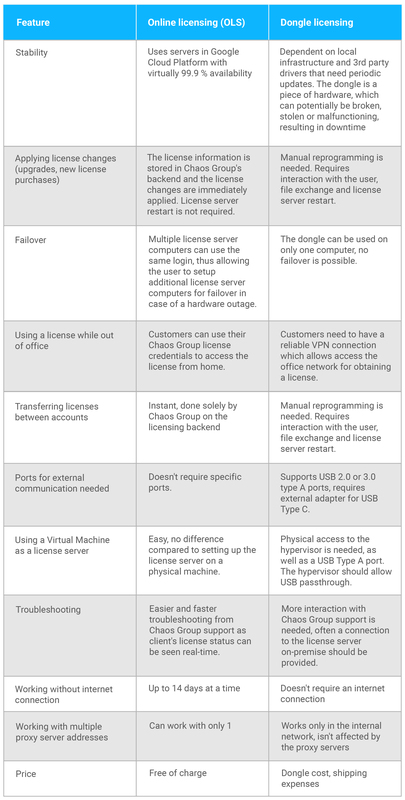 However, we strongly recommend you choose OLS instead of dongle licensing. As there has been a decrease in dongle sales, Chaos will be implementing a price increase for the dongle in the coming months. Dongle vs OLS – What’s The Difference? Please take a look at the comparison chart below to see why it makes sense to go with the OLS option whenever possible. Tell us about your specific requirements which mean you strictly need a dongle, whether it is your setup, workflows, security policies or anything else. Can you think of any additional features or options that need to be added to OLS? Let us know!